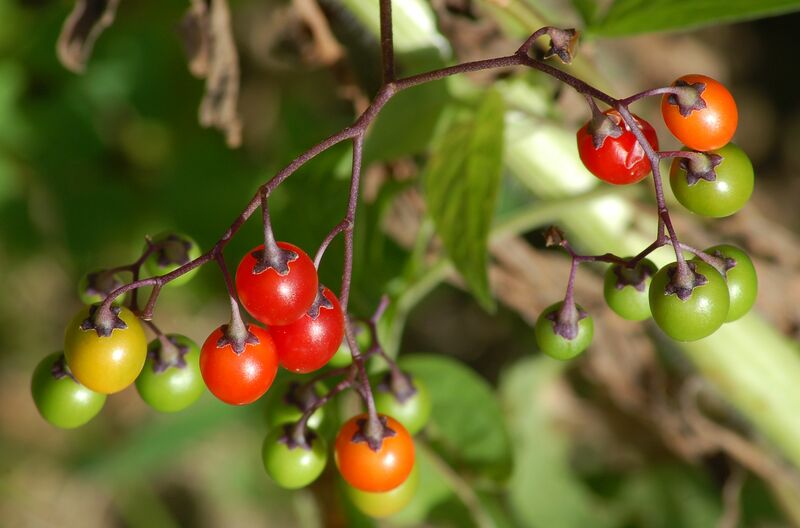 Pictures of poisonous plants can help you to identify vegetation and berries that should not be touched or eaten. Some weeds can cause rashes on contact. This list includes information about beneficial weeds and natural remedies that help counteract the itching caused by a couple of noxious weeds. No matter what, always consult with medical professionals when you suspect that you have wound up on the wrong end of an encounter with a poison of any kind. Bittersweet nightshade (Solanum dulcamara) is a very common weed and is especially dangerous to have around kids, as kids are attracted to its brightly colored berries. Relatively few parents can identify bittersweet nightshade on their property. It is often confused with American bittersweet and Oriental bittersweet plants. Related to bittersweet nightshade (and equally toxic) is the Chinese lantern plant (Physalis alkekengi), which is commonly grown by crafts enthusiasts. The initial color of the pods' husks is green. This color changes to yellow late in the summer. By fall, it is a rich orange. The colorful pods are used in dried floral arrangements and wreaths. Foxgloves (Digitalis spp.) grow well in a spot with dry shade, which can be a problematic area in the yard. But they are among the most toxic specimens commonly grown on the landscape. Do not grow them if small children will be spending time in the yard. If you live in the country in eastern North America, you may have some mountain laurel (Kalmia latifolia) growing wild in your backyard. Cultivars of mountain laurel are also sold at nurseries, including the beautiful Minuet laurel. Like mountain laurel, azaleas and rhododendrons (Rhododendron spp.) belong to the heath family and are toxic. Do not let pets nibble on any of these shrubs. Castor bean (Ricinus communis) is a tropical plant widely grown as an annual in northern climates, often as a potted plant for patios, decks, or porches. The leaves, stalk, and seed-heads are all attractive. The laxative, castor oil, is derived from castor bean plants, but so is the deadly toxin, ricin. Yew bushes (Taxus spp.) can be grown in sun or shade. This plant's shade tolerance gives landscape designers an important option in challenging areas. But its fleshy, bright-red berries contain a seed that is toxic. The needle-like leaves are also poisonous, so do not let pets or kids chew on them. The entries listed so far are all toxic if eaten. But in the case of some other plants, all you have to do is touch it to be exposed to its toxicity, and the result will be a rash. Poison sumac (Toxicodendron vernix) is an example. It gives all sumac shrubs a bad name, despite the fact that most are quite harmless and beautiful in fall. What makes poison ivy (Toxicodendron radicans) toxic? It's an oil called, "urushiol." Urushiol's rash-inducing property has inspired a song, a DC Comics villain, and great fear in people walking in the woods. How can nature be so unfair as to hold this menace over your head when you are simply trying to enjoy the great outdoors? Well, as if to balance things out, nature has also provided jewelweed (Impatiens capensis). Jewelweed is also called, "touch-me-not," but not because it is toxic. Rather, jewelweed is considered a natural remedy for poison ivy rash. Like poison ivy, jewelweed is very common. Both could very well be growing in your backyard. It is easy to identify jewelweed, once you recognize its cornucopia-shaped flower with a distinct little tail. It is more difficult to identify poison ivy because there is no pretty flower to help you out (just a dull, insignificant bloom). "Easter" lilies (Lilium longiflorum) is a misnomer for these toxic trumpets. You can thank the workers at a greenhouse somewhere for your being able to inhale their heady perfume at Easter in cold climates. The workers had to take great pains to trick them into blooming at what is, truth be told, really out of season for them. Thus many Easter lily recipients in the North who decide to take a crack at growing them outside are disappointed when next spring rolls around and they do not bloom. The fact is, you cannot expect Easter lilies to bloom outdoors much earlier than when most of the other popular lilies flower (July), such as Lilium Stargazer. If only this were our greatest concern in growing Easter lilies, though. More problematic is that they are deadly toxic to cats, as are Stargazer lilies. Like poison sumac and poison ivy, stinging nettles (Urtica spp. ), as its name suggests, is not a plant you want to brush up against when working out in the yard. Your skin will burn with a painful itch for a short time after contact with its rash-inducing spines. Don't confuse stinging nettles with dead nettles, a perennial used as a ground cover in shady areas. The ASPCA lists yellow dock (Rumex crispus) as being toxic to dogs. Like jewelweed, however, yellow dock (or "curly" dock) is a medicinal plant that can be used to counteract the discomfort caused stinging nettles. Just roll one of the fresh, green leaves of dock between your thumb and forefinger to crush it into a juicy pulp; then rub it on your burning skin. Dock is easy to identify late in the season. The mature flower head of a yellow dock plant looks like coffee grounds after its blooms have dried and assumed a brown color. Lantana camara bears colorful flower clusters and is commonly used as an annual by gardeners in cold climates in hanging pots. Growers in warmer climates are familiar with lantana as a shrub, where this vigorous grower may even be invasive. But its invasiveness is not the only issue that comes with growing lantana: Its berries can be fatal if eaten. Lily-of-the-valley (Convallaria majalis) is a traditional wedding flower. And why not? 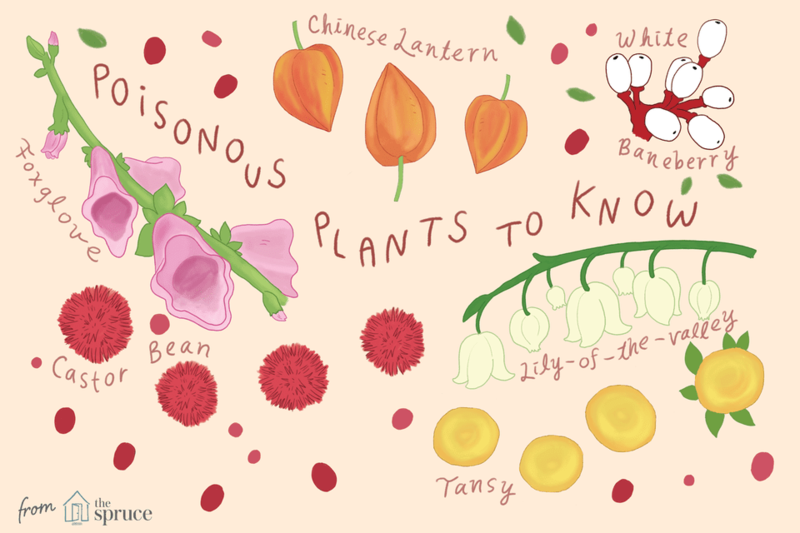 Its flowers are bell-shaped (think "wedding bells"), fragrant, and white (think "innocence"). From a landscaping perspective, though, you might not want to push that innocence thing too far: Lily-of-the-valley is invasive. And if you have children playing in the yard, it is a poisonous plant. Learn to identify it and make sure that this common ground cover is not growing in your yard (unless fragrance trumps toxicity and invasiveness for you). Then, there is baneberry (Actaea), which comes in both a red and a white form. If its toxicity is not enough to scare you, stare into the spooky "doll's eyes" of the white form (pictured). Tansy (Tanacetum vulgare) was once a much valued herb that has now fallen from grace. It is a perennial that is often grown simply for its golden flowers, which are numerous and look like cute little buttons. But growers of livestock fear it as a poisonous plant. You, too need to be aware of its toxic qualities if you have kids, dogs, or cats that play out in the yard. Not only should they not nibble on tansy, but even brushing up against it can give some people a rash.